August 5, 2012 - The opportunity to travel into space may be here sooner than many people thought according to a study the Federal Aviation Administration (FAA) and Space Florida released. Based on a market forecast for reusable suborbital rockets, more than 10,000 commercial opportunities may be available in the next decade for a person to experience weightlessness through space travel and to see the curvature of the earth. Suborbital Reusable Vehicles (SRVs) are rockets designed to travel into space without achieving orbit. 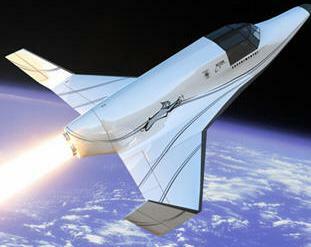 To date, existing types of suborbital vehicles have taken hundreds of component and test flights. Already, five new designs are being developed, with initial operations planned to begin in 2013 and 2014. The FAA is responsible for licensing, regulating and inspecting SRVs. To help the industry, the FAA and other government agencies meet future SRV market demand, the “Ten Year Forecast of Suborbital Reusable Vehicles” analyzes emerging SRV markets and identifies drivers of growth. The study includes three scenarios of demand for the SRV market based on modest, decreased and significant growth. Looking at the most favorable “Growth Scenario,” the study finds the number of available seats would increase from 1,096 seats in the first year to 1,592 seats in the 10th year. The study also indicates that over a 10-year period, SRV flights could bring in an estimated $300 million to more than $1.6 billion in economic impact. Based on the market study, SRVs have the potential to offer more than just opportunities for space tourism. Although the leading market is expected to be commercial human space flight, the study also shows that other potential markets include: aerospace technologies testing and demonstrations; educational opportunities; basic applied research; media and entertainment; as well as, small satellite deployment. In fact, one day SRVs may also help in earth imagery and point to point transportation. Commercial Human Spaceflight – The largest of potential SRV markets, these short rocket flights provide participants with one to five minutes of microgravity. According to the study, typically such flights would be purchased by individuals, and corporate clients. Basic and Applied Research – The next largest market is research, which appears to support demand for hundreds of experiments in a number of areas. SRVs could help facilitate potential studies that involve both biological and physical research addressing atmospheric science, space science and human functioning. Education –This is the fastest growing market, as educational flight opportunities are integrated into curriculums. Educational applications offer potential for kindergarten to 12th grade experiences, as well as university instructional missions. Aerospace Technology Test and Demonstration – SRV allow for testing of technologies in reduced gravity, radiation, heat, and vacuum environments. Media and Public Relations – Film and television studios may find commercial advantage in having access to space. Satellite Deployment – Very small satellites could be launched from specially designed SRVs. Two additional markets do not appear to involve near-term market demand, although longer-term potential may eventually become evident. Remote Sensing– This application involves generation of commercial Earth imagery for civilian and military purposes. Point to Point Transportation – SRVs would be used to provide high speed passenger, troop or package transportation. To date, there have already been hundreds of component and test flights by existing types of suborbital vehicles. Eight vehicle designs are being developed, with initial operations planned to begin in 2013 and 2014. The study presents three scenarios based on modest, decreased and significant growth. Baseline Scenario – The report finds that over 10 years demand increases from 373 seats in the first year of regular operations to 533 seats in the 10th year, for a ten-year total of 4,518 seats. This scenario looks at today’s consumer demand and research budgets, with daily flights bringing in nearly $600 million over 10 years. Constrained Scenario– The report finds that demand over 10 years, involves 213 seats in the first year, increasing to 255 seats in the 10th year. This scenario recognizes a significant drop from today’s demand. With multiple flights per week, activities may bring in $300 million over 10 years. Growth Scenario— The report finds that over 10 years, the demand for seats increases from 1,096 in the first year to 1,592 seats in the 10th year, with a total of 13,134 seats over 10 years. This scenario looks at increased demand due to the positive cumulative effect of marketing and research successes with multiple flights per day, bringing in over $1.6 billion over 10 years.